The Undaunted are a faction of dungeon-delving adventurers who set the scene for each of the Group Dungeons and Trials that can be found in the world. The locations of each of the base-game dungeons can be discovered by talking to Undaunted members within the tavern in the main city of each zone, while DLC dungeons become accessible upon unlocking the related DLC. Note that all dungeons and trials can be traveled to directly from a Wayshrine once you have learned their location. The Undaunted skill line focuses on group utility, and provides skills which aid allies in group combat as well as dealing wide-ranging damage. All of the abilities give the opportunity to activate synergy. To gain reputation with them, you must complete Dungeon Achievements (not including those in the Public Dungeons section), Pledges and delve dailies. Banished Cells I — Banishing the Banished: Help imprison the spirit of an evil Altmer. Banished Cells II — The Plan: Return to the Banished Cells and free its keepers from Daedric servitude. City of Ash I — Razor's Edge: Drive back the Daedra from a burning Bosmeri city. City of Ash II — Return to Ash: Enter the Deadlands to rescue a failed invasion force. Elden Hollow I — Ancient Remains: Investigate Wood Orc activity in the ruins beneath Elden Root. Elden Hollow II — Consuming Darkness: Delve into Oblivion and save Bakkhara. Selene's Web — Knowledge Gained: Help guide a Mages Guild expedition through a dangerous forest. Tempest Island — Eye of the Storm: Defeat the invading Maormer on Tempest Island. Blackheart Haven — Jumping Ship: Break the curse of Blackheart Haven. Crypt of Hearts I — Lover's Torment: Free a cursed soul from her torment. Crypt of Hearts II — Edge of Darkness: Release the Crypt of Hearts from Mephala's grip. Spindleclutch I — Deadly Whispers: Aid the Fighters Guild members in clearing the Spindleclutch I caves. Spindleclutch II — Blood Relations: Rescue Sud-Hareem's son At'avar from a powerful vampire. Volenfell — Blood and Sand: Help a Dwemer researcher recover her notes on a Dwemer artifact. Wayrest Sewers I — Deception in the Dark: Prevent an underground invasion of Wayrest. Wayrest Sewers II — No Second Chances: Return the Pellingare siblings to the grave. Arx Corinium — Force of Nature: Help three nereid sisters reclaim an abandoned Imperial fort. Blessed Crucible — Fires of Battle: Compete in a fiery arena to claim the Brimstone Crown. Darkshade Caverns I — Mine All Mine: Investigate a disturbance in Deshaan's largest kwama mine. Darkshade Caverns II — What Was Lost: Help investigate some Dwemer ruins. Direfrost Keep — Nobles' Rest: Release an ancient fortress from the grasp of a witch. Fungal Grotto I — Kings of the Grotto: Clear out an old grotto for a group of Mephala worshippers. Fungal Grotto II — Lighting the Shadows: Help the Fighters Guild stop the Spider Cult from raising an army of shadows. Vaults of Madness — Mind of Madness: Escape a labyrinthine structure in Coldharbour. Imperial City Prison — Summary Execution: Aid Lyranth on her path to vengeance, and liberate some lost souls along the way. White-Gold Tower — Planemeld Obverse: Fulfill the prophecy of an Elder Scroll by freeing the White-Gold Tower from Coldharbour's clutches. Cradle of Shadows — Silk and Shadow: Help a Shadowscale destroy a dangerous new group of assassins. Ruins of Mazzatun — Sap and Stone: Eliminate the Xit-Xaht threat in the Ruins of Mazzatun. Bloodroot Forge — Blood for Blood: Neutralize an ancient forge and put an end to the evil plans of the Dreadhorn Clan. Falkreath Hold — Falkreath's Demise: Lift the siege of Falkreath to save the city's inhabitants. Fang Lair — Casting the Bones: Investigate a necromancer cult searching for a long-dead Dragon. Scalecaller Peak — Plans of Pestilence: Conquer Scalecaller Peak and stop a dangerous plague from spreading. March of Sacrifices — The Great Hunt: Conquer the March of Sacrifices and emerge victorious in the Great Hunt. Moon Hunter Keep — Moonlight Ascent: Explore an old Silver Dawn stronghold and deal with the werewolves controlling it. Hel Ra Citadel — Assaulting the Citadel: Launch an attack on the Celestial Warrior's stronghold. Aetherian Archive — The Mage's Tower: Defeat the Celestial Mage to save her from the Serpent. Sanctum Ophidia — The Oldest Ghost: Launch a direct assault on the Celestial Serpent. Maw of Lorkhaj — Into the Maw: Stop the dro-m'Athra from flooding into Tamriel. Halls of Fabrication — Forging the Future: Stem the tide of fabricants before they overwhelm Tel Fyr. Asylum Sanctorium — Saints' Mercy: Neutralize a threat within the Asylum Sanctorium. Cloudrest — Woe of the Welkynars: Help a Gryphon Knight defeat a powerful Sea Sload sorceress and save Cloudrest. Delve Dailies are repeatable quests offered by Bolgrul, located at the Undaunted Enclave in each Alliance capital. These quests will send you to a specific delve in the world. Unlike pledges, these quests can be shared with your group, and thus it is possible to do up to 15 of these quests in a day per character. These quests will reward 10 Undaunted reputation, as well as small box of rewards. These quests are one way of obtaining the Draugr motif. Ancestor Wards in Deshaan: Contain the spirits by placing wards and killing the strongest. Ayleid Trinkets in Grahtwood: Collect Ayleid trinkets and defeat Raynia. Cursed Baubles of Stormhaven: Return cursed items to a Daedra-infested ruin. Darkness Blooms in Rivenspire: Prove your worth to Bolgrul by taking a bet in Orc's Finger Ruins. Dwarven Relics of Stonefalls: Gather dwarven relics for a pair of interested patrons. Give and Take in Shadowfen: Recover stolen relics from Atanaz Ruins. Inflamed Pyres of The Rift: Light memorial pyres and defeat Jakalor in Shroud Hearth Barrow. Veiled Darkness in Auridon: Banish Daedra in Mehrunes' Spite. The Undaunted Pledges are repeatable quests which become available at Level 45 from the Undaunted Enclave in your Alliance Capital, and task your group with clearing out a dungeon. It is possible to complete up to three pledges per character per day. Maj al-Ragath, Glirion the Redbeard and Urgarlag Chief-bane will each offer one pledge. Pledges rotate in a fixed order, and certain dungeons are associated with specific NPCs as listed below. The three pledges offered are identical for all players and will reset daily. Completing a normal or veteran mode Pledge will reward you with a key, while completing a veteran hard mode Pledge will reward two keys and all Pledges will award 20 Undaunted reputation[verification needed — This is inconsistent with the values under #Reputation]. The maximum number of keys that can be earned in a day is thus six. Each key can be used without restriction at any of the three reward chests in the Undaunted enclave. 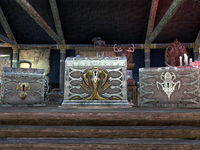 Chests are guaranteed to contain a monster set shoulder piece, but each chest can only drop sets from dungeons associated with the NPC that the chest is named after. In other words, if you wanted a Molag Kena shoulder piece, you should only open Urgarlag's reward chest. Pledges marked with a require the related DLC to be purchased from the Crown Store in order to complete. As of Update 12, these will only be handed out by Urgarlag Chief-bane, so players without access to the DLCs can easily avoid them by only getting pledges from Maj and Glirion. Pledge: Spindleclutch II: Explore Spindleclutch II and return Undaunted. Pledge: Fungal Grotto II: Explore Fungal Grotto II and return Undaunted. Pledge: Darkshade II: Explore Darkshade Caverns II and return Undaunted. Pledge: Wayrest Sewers II: Explore Wayrest Sewers II and return Undaunted. Pledge: Darkshade Caverns I: Explore Darkshade Caverns I and return Undaunted. Pledge: Vaults of Madness: Prove you are truly Undaunted by clearing the Vaults of Madness. Pledge: Crypt of Hearts II: Prove you are truly Undaunted by clearing the Crypt of Hearts II. Pledge: Tempest Island: Prove you are truly Undaunted by clearing Tempest Island. Pledge: City of Ash II: Prove you are truly Undaunted by clearing the City of Ash II. Pledge: Crypt of Hearts I: Prove you are truly Undaunted by clearing the Crypt of Hearts I. Pledge: Blessed Crucible: Prove you are truly Undaunted by clearing Blessed Crucible. Pledge: Imperial City Prison: Prove you are truly Undaunted by clearing Imperial City Prison. Pledge: Moon Hunter Keep: Prove you are truly Undaunted by clearing the Moon Hunter Keep. Before Update 12, pledges functioned much differently. Starting at level 45, Maj al-Ragath would offer Normal pledges for the sixteen original dungeons, which would reward either a "Bronze Undaunted Key" or a "Silver Undaunted Key" depending on the performance of certain tasks. At level 50, Glirion the Redbeard would offer Veteran pledges for the original Veteran mode dungeons (now known as "Story II") as well as DLC-specific dungeons, which would reward a "Silver Undaunted Key" or a "Gold Undaunted Key". These different types of keys unlocked different tiers of reward chests. The fact that Glirion gave out DLC-specific pledges meant that his pledge reward would essentially be blocked on those days for players without the DLC. Darkshade Caverns Pledge: Explore Darkshade Caverns and return Undaunted. Elden Hollow Pledge: Explore Elden Hollow and return Undaunted. Banished Cells Pledge: Explore the Banished Cells and return Undaunted. Blackheart Haven Pledge: Explore Blackheart Haven and return Undaunted. Arx Corinium Pledge: Explore Arx Corinium and return Undaunted. City of Ash Pledge: Explore the City of Ash and return Undaunted. Tempest Island Pledge: Explore Tempest Island and return Undaunted. Selene's Web Pledge: Explore Selene's Web and return Undaunted. Vaults of Madness Pledge: Explore the Vaults of Madness and return Undaunted. Spindleclutch Pledge: Explore Spindleclutch and return Undaunted. Blessed Crucible Pledge: Explore the Blessed Crucible and return Undaunted. Wayrest Sewers Pledge: Explore Wayrest Sewers and return Undaunted. Fungal Grotto Pledge: Explore Fungal Grotto and return Undaunted. Crypt of Hearts Pledge: Explore the Crypt of Hearts and return Undaunted. Direfrost Keep Pledge: Explore Direfrost Keep and return Undaunted. Volenfell Pledge: Explore Volenfell and return Undaunted. Veteran Crypt of Hearts Pledge: Prove you are truly Undaunted by clearing Veteran Crypt of Hearts. Veteran Banished Cells Pledge: Prove you are truly Undaunted by clearing the Veteran Banished Cells. Ruins of Mazzatun Pledge: Prove you are truly Undaunted by conquering the Ruins of Mazzatun. Cradle of Shadows Pledge: Prove you are truly Undaunted by clearing the Cradle of Shadows. Veteran City of Ash Pledge: Prove you are truly Undaunted by clearing the Veteran City of Ash. Veteran Elden Hollow Pledge: Prove you are truly Undaunted by clearing Veteran Elden Hollow. Veteran Spindleclutch Pledge: Prove you are truly Undaunted by clearing Veteran Spindleclutch. Imperial City Prison Pledge: Prove you are truly Undaunted by clearing the Imperial City Prison. White-Gold Tower Pledge: Prove you are truly Undaunted by clearing the White-Gold Tower. Veteran Darkshade Pledge: Prove you are truly Undaunted by clearing Veteran Darkshade Caverns. Veteran Wayrest Sewers Pledge: Prove you are truly Undaunted by clearing Veteran Wayrest Sewers. Veteran Fungal Grotto Pledge: Prove you are truly Undaunted by clearing Veteran Fungal Grotto. The Undaunted also offer rewards for completing random dungeons through the dungeon finder. Unlike pledges, there are no objectives to complete and no quest is given. The rewards and experience are automatically sent to you the moment the final boss of the dungeon dies. Completing the Daily event will grant Premium Undaunted Exploration Supplies. This event has a 20 hour cooldown per character, which means that any subsequent completion with the same character before the time is up will grant Undaunted Exploration Supplies. This is the same regardless of whether the dungeon is set to Normal or Veteran difficulty. A leveled Epic item from the Agility, Endurance, or Willpower sets. A leveled Superior item from the Agility, Endurance, or Willpower sets. The Undaunted have a meeting place in each of the major zones. They will give you the locations of Dungeons both in your own alliance's territory and the other two zones of corresponding level to where you meet them, allowing you to fast-travel to them even without being able to access the rest of the zone. Also, one member at each location will give you the option to buy them a drink. Doing so at each of these locations will earn you the This One's On Me achievement. Note that members of the Undaunted can be encountered at places outside the scope of this list. Conjure a fountain of blood to apply Minor Lifesteal to enemies in the area, healing you and your allies for 600 Health every 1 second when damaging them. Allies in the area can activate the ​ Blood Funnel synergy, healing for 40% of their Max Health. Sanguine Altar Increases the duration and reduces the cost. Cost: 2160 Magicka, Duration: [40 / 42 / 44 / 46] seconds. Overflowing Altar Increases the amount the synergy heals for. Conjure a fountain of blood to apply Minor Lifesteal to enemies in the area, healing you and your allies for 600 Health every 1 second when damaging them. Allies in the area can activate the ​ Blood Feast synergy, healing for [62 / 63 / 64 / 65]% of their Max Health. Hurl webs to ensnare your foes, reducing the Movement Speed of enemies in the area by 50%. After 5 seconds the webs explode, dealing [6150 / 6217 / 6284 / 6353] Poison Damage to enemies within. A ranged ally targeting an enemy in the webs can activate the ​ Spawn Broodlings synergy, dealing 7826 Poison Damage to them and summoning two spiders to attack for 15 seconds. The spiders bite enemies for 1647 Physical Damage. Shadow Silk The synergy summons more powerful black widow spiders which deal additional damage over time. Hurl webs to ensnare your foes, reducing the Movement Speed of enemies in the area by 50%. After 5 seconds the webs explode, dealing [6354 / 6422 / 6493 / 6564] Poison Damage to enemies within. A ranged ally targeting an enemy in the webs can activate the ​ Black Widows synergy, dealing 7826 Poison Damage to them and summoning two spiders to attack for 15 seconds. The spiders bite enemies for 1647 Physical Damage and can poison them for 18000 Poison Damage over 10 seconds. Tangling Webs The synergy also fears the enemy. Hurl webs to ensnare your foes, reducing the Movement Speed of enemies in the area by 50%. After 5 seconds the webs explode, dealing 6354 Poison Damage to enemies within. A ranged ally targeting an enemy in the webs can activate the ​ Arachnophobia synergy, dealing 7826 Poison Damage to them, fearing them for [3.5 / 3.8 / 4.2 / 4.5] seconds, and summoning two spiders to attack for 15 seconds. The spiders bite enemies for 1647 Physical Damage. Ignite the fires of hate in an enemy's heart, dealing [3074 / 3106 / 3140 / 3175] Magic Damage and taunting them to attack you for 15 seconds. A ranged ally targeting the taunted enemy has a 25% chance to activate the ​ Radiate synergy, dealing 2344 Magic Damage to them over 2 seconds then an additional 6875 Magic Damage to them and other nearby enemies. Inner Rage Increases the chance to grant a synergy. Ignite the fires of hate in an enemy's heart, dealing 3174 Magic Damage and taunting them to attack you for 15 seconds. A ranged ally targeting the taunted enemy has a [35 / 36 / 37 / 38]% chance to activate the ​ Radiate synergy, dealing 2344 Magic Damage to them over 2 seconds then an additional 6875 Magic Damage to them and other nearby enemies. Inner Beast Converts into a Stamina ability. Ignite the fires of hate in an enemy's heart, dealing [3176 / 3210 / 3245 / 3280] Physical Damage and taunting them to attack you for 15 seconds. A ranged ally targeting the taunted enemy has a 25% chance to activate the ​ Radiate synergy, dealing 2344 Magic Damage to them over 2 seconds then an additional 6875 Magic Damage to them and other nearby enemies. Duration: [5 / 5.3 / 5.7 / 6] seconds. Surround yourself with a whirlwind of bones, gaining a damage shield that absorbs 30% of your Max Health for [5 / 5.3 / 5.7 / 6] seconds. An ally near you can activate the ​ Bone Wall synergy, granting the ally and up to 3 other friendly targets near them a damage shield that absorbs 50% of their Max Health for 6 seconds. Spiked Bone Shield Returns damage back to enemies using melee attacks. Surround yourself with a whirlwind of bones, gaining a damage shield that absorbs 30% of your Max Health for 6 seconds and returns [30 / 31 / 32 / 33]% of any direct damage absorbed back to the enemy. An ally near you can activate the ​ Bone Wall synergy, granting the ally and up to 3 other friendly targets near them a damage shield that absorbs 50% of their Max Health for 6 seconds. Bone Surge The synergy increases healing received. Cost: [3780 / 3690 / 3600 / 3510] Stamina. Surround yourself with a whirlwind of bones, gaining a damage shield that absorbs 30% of your Max Health for 6 seconds. An ally near you can activate the ​ Spinal Surge synergy, granting the ally and up to 3 other friendly targets near them a damage shield that absorbs 50% of their Max Health for 6 seconds and Major Vitality, increasing their healing received by 30%. Project a globe of annihilation that slowly floats forward, dealing [834 / 843 / 852 / 861] Magic Damage every 1 second to nearby enemies. An ally near the globe can activate the ​ Combustion synergy, causing the orb to explode for 6149 Magic Damage to nearby enemies and restore 3960 Magicka or Stamina to the ally, whichever maximum is higher. Mystic Orb Increases the damage. Project a globe of annihilation that slowly floats forward, dealing [984 / 994 / 1005 / 1017] Magic Damage every 1 second to nearby enemies. An ally near the globe can activate the ​ Combustion synergy, causing the orb to explode for 6149 Magic Damage to nearby enemies and restore 3960 Magicka or Stamina to the ally, whichever maximum is higher. Energy Orb The orb heals allies instead of damaging enemies. Project a globe of regeneration that slowly floats forward, healing for [862 / 872 / 882 / 891] Health every 0.5 seconds to you and nearby allies. An ally near the globe can activate the Healing ​ Combustion synergy, causing the orb to explode and heal for 6149 Health to all friendly targets and restore 3960 Magicka or Stamina to the ally, whichever maximum is higher. Undaunted Command 6 Activating an ally's synergy restores 2% of your Max Health, Stamina, and Magicka. 8 Activating an ally's synergy restores 4% of your Max Health, Stamina, and Magicka. Undaunted Mettle 7 Increases your Max Health, Stamina, and Magicka by 1% per type of Armor (Heavy, Medium, Light) that you have equipped. 9 Increases your Max Health, Stamina, and Magicka by 2% per type of Armor (Heavy, Medium, Light) that you have equipped. ​ This One's On Me 15 Buy drinks for your Undaunted companions at each gathering. Risk and Challenge 5 Complete the first of Bolgrul's Undaunted challenges. Gold and Bragging Rights 10 Complete 10 of Bolgrul's Undaunted challenges. A Crown of Your Own Trousers 15 Complete 30 of Bolgrul's Undaunted challenges. This page was last modified on 19 March 2019, at 21:16.